It turns out that a lot of my friends have quit caffeine, and they were all willing to talk about the experience. However, after a few conversations, I started feeling less grateful and more terrified. Most of them said they basically felt like garbage for the first four days. If I felt like I did yesterday for four days, Adam would have to lock me in the barn like a werewolf. If I made it through, anyway. Yesterday, that was not at all certain. 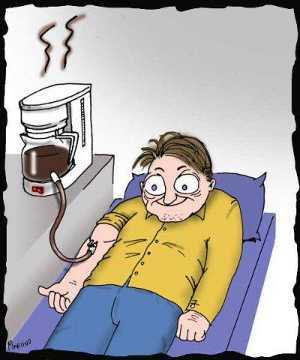 It’s funny, I used to scoff when people said caffeine was a drug, but now I totally believe them. I’m sorry I scoffed at you, totally correct people. It is a drug, and now I know better. I’ve been saying that I’m just doing this for as long as I’m on the diet, but now I’m starting to wonder if it isn’t better to stay off caffeine in the long-term. I don’t really love having something like that control my life, and I’m also noticing that I’m way calmer without it. Perhaps a daily dose of stimulants isn’t the best thing in the world for someone with anxiety issues. Anyway, after preparing for a horrible four days, I woke up this morning and felt like a million bucks. I might even go to the gym later, but no promises. Me, in unhappier (?) times.